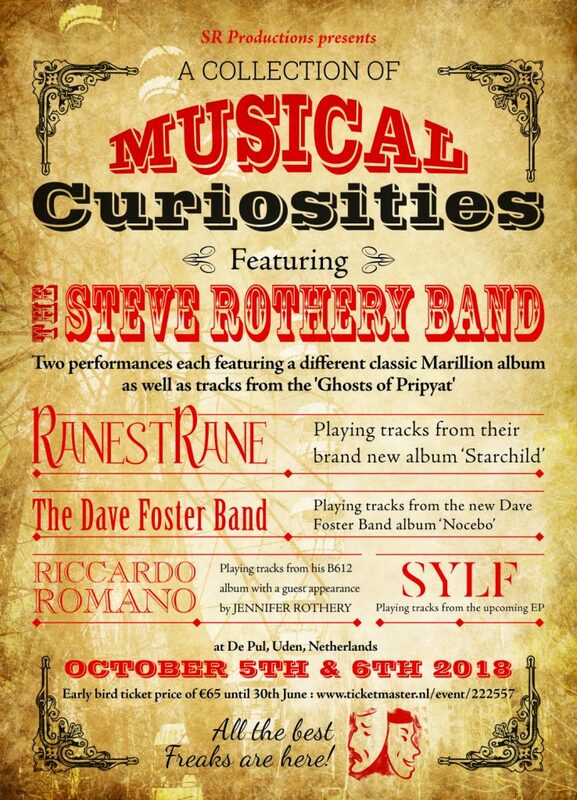 Clear your schedule for the weekend of the 5th and 6th of October, because De Pul in Uden will be the host of A Collection of Musical Curiosities. A two-day festival built around the Steve Rothery Band. As you will undoubtedly know, Riccardo Romano is the keyboard player of this instrumental ensemble. It is therefore no surprise that RanestRane will also play a set, on Friday October 5th. But there more: on Saturday, there will be a unique show by Riccardo’s soloproject: Riccardo Romano Land. This will be one of the first live performance of this band, in any case it will be the first in the Netherlands. Riccardo and friends will play songs from his album B612. Those of you who have checked this album out, will know that a great gathering of musicians contributes to it: this collegues from RanestRane, both the Steves from Marillion, The Dave, Martin Jakubski (from StillMarillion) and Jennifer Rothery. During the 2017 Marillion weekend it became clear that Steve’s daughter posseses a great voice, which is confirmed by her performance on B612. Many of the guest musicians will be present during the weekend, as also the Dave Foster Band and Sylf (Jennifers stagename) will play a set of their own. And since the Steve Rothery Band will perform two classic Marillion albums, I suspect Martin will make an appearance. Of course it is not sure that they all will be on stage with Riccardo, but according to poster Jennifer will sing on his show. In short, we can look forward to two days of top acts from the progressive scene. Oh please do come! 23:00-00-00 Aftershow signing session and meet and greet.